University of Southampton graduate Tom Crowley is enjoying the double success of the BBC’s much-heralded Planet Earth II after the nature programme scooped two awards at this year’s British Academy Television Awards. Crowley, a wildlife camera operator and assistant producer for the BBC’s Natural History Unit, travelled the world to film sequences for Planet Earth II which won BAFTAs for ‘Specialist Factual’ and ‘Must-see Moment’. On its debut in November 2016, Planet Earth II became the UK’s most-watched natural history documentary in more than 15 years, attracting over 12.2m views. 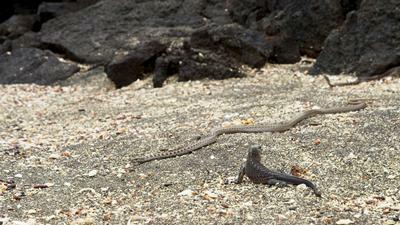 One of the most compelling sequences of the series captured by Crowley and his colleagues depicted a newly-hatched Marine Iguana attempting to run a gauntlet of Galapagos racer snakes to make its way to the sea and survival. Not only was the footage named ‘Must-see Moment’ of the last 12 months by BAFTA, it also won the Timeline TV Moment of the Year at the Broadcast Awards earlier this year. “The reaction to the Marine Iguana sequence has been quite remarkable; I would never have guessed that people would be shouting and cheering at their televisions as a small reptile ran furiously away from a bunch of snakes. It was just the type of story I love to film; really strong behaviour and very compelling,” said Crowley who completed his BSc in Marine Science at Southampton in 2001. “Those little iguanas are as tough as nails and they only hatched a few minutes before we shot that,” continued Crowley who previously worked on the BBC’s highly successful Frozen Planet series and is filming the corporation’s next venture, Seven Worlds. “We spent about 24 days on Isla Fernandina in the Galapagos on a little wooden boat to get the sequence. It was a real collaboration, which is one of the aspects I love about the job. You need everyone to be working together to succeed in these situations and no one person could have done it on their own. Click here to view the full iguana sequence from BBC TV’s Planet Earth II. Read our full interview with Tom Crowley in Southampton Connects Alumni.